Employers are responsible for ensuring the correct extinguishers are in place, available and serviceable for the appropriate hazards as a result of work practices within the workplace. Fire extinguishers are to be serviced as set out in the table below to the appropriate standard as stated under the Regulatory Reform Order 2005 and in accordance with BS 5306 part 3. 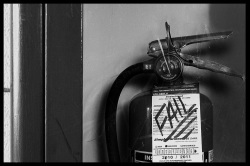 It is advised that a workplace generates a monthly visual check and recording method of all fire safety related equipment to be included in the workplace housekeeping routine(s). See an example servicing table below and click HERE for type uses.